I joined Newsweek in 1971 as the Cover Art Director and ascended to Senior Editor 9 years later. I designed over 1,000 covers during my 21 year tenure and 17 of them are featured in Newsweek's last issue. I designed 32 covers during the Watergate era and every one was quite a challenge. The "Nixon Tapes" was by far my favorite. The image was a tape deck atop the white house photographed from the air by the peerless Wally McNamee. A sketch was faxed to Wally on a Wednesday morning and he flew over the White House at great risk to capture an image matching the sketch at the exact angle needed. Wally rushed his film to New York and I borrowed a tape recorder from the audio visual department and headed to a photography studio with a copy of the sketch. There was no such thing as Photoshop in 1973 so dye transfer prints had to be made and a photo retoucher had to put everything together. The project was completed Friday night. The cover ran after revelations that President Richard Nixon had a secret tape recorder running full time in the Oval Office in the early 1970s. One of the tapes, subsequently subpoenaed, was the “smoking gun” triggering Nixon’s resignation. It recorded Nixon ordering aides to get the CIA involved in covering up the White House’s responsibility just six days after burglars had been caught in Democratic Party national headquarters in the Watergate in June 17, 1972. 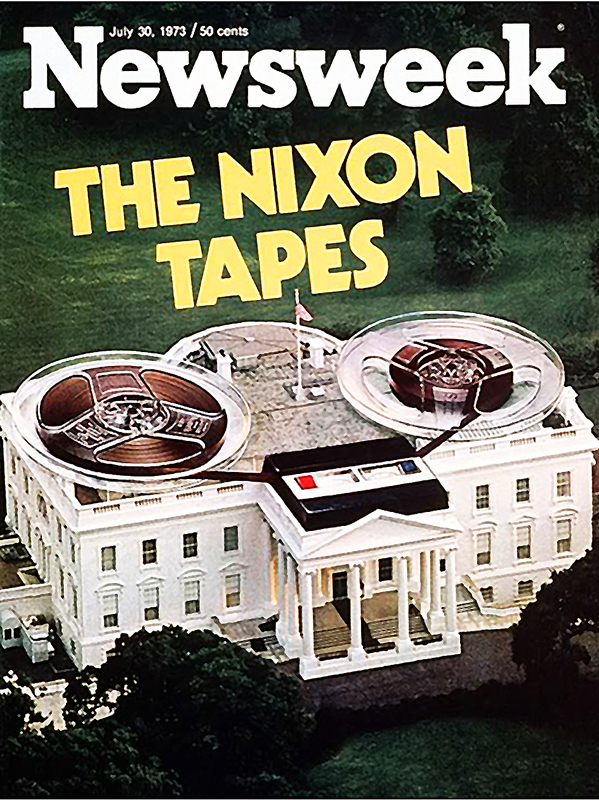 The Nixon Tapes cover was selected as one of the 40 best covers ever designed in America by The Society of Magazine Editors. It also won 6 graphic design awards. I am gazing up at a giant poster of it on my wall as I type this piece. Meyerson worked at Newsweek from 1972 to 1992.